What's Making My Cat Sneeze ? Several things can cause a cat to sneeze: dust, allergens, and - similarly to humans - a "cold." In cats, sneezing that lasts more than two days is likely due to a viral upper respiratory infection (URI) - what we might term a "kitty cold." Of the seven viruses or bacteria known to cause feline URI's, three cause serious illnesses, resulting in anorexia, high fever, and ulcers of the tongue and cornea: the feline rhinotracheitis (also called 'feline herpesvirus'), the feline calicivirus, and the bacteria Chlamydia psittaci. The remaining viruses cause mild sneezing for a few days, but rarely become a serious problem. As a rule, the uncomplicated forms of these viral infections are no more severe than the common cold. However, even mild infections can become life threatening if secondary bacterial infections develop in the nose, oral cavity, or eyes. This can lead to loss of appetite—a very serious complication, as the cat will quickly become malnourished and dehydrated, resulting in further complications and compromised ability to fight the virus. Sneezing for More Than Two Days? Bring Your Kitty In. . .
Because of the chance of secondary bacterial infections, your best course of action with a suspected URI is to bring your kitty to us. The doctor can then determine the severity of the condition and advise you on the best course of treatment. 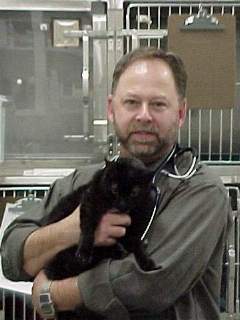 The first decision we will make is where it is best to treat your kitty—in the hospital, or at home? If the cat is eating, treating at home is preferable. However, if there are other cats at home who have not been infected, it may be best to treat in the hospital in order to protect the healthy cats. These viruses are extremely contagious and are easily spread by sneezing and the sharing of water bowls. If your cat is not eating, hospitalization is also preferable so that proper antibiotics and nutrition may be administered. If treatment is prompt, all but a very few cats will recover completely. What happens if your cat has had an infection due to the rhinotracheitis virus or the calicivirus? Well, even if your kitty recovers completely, s/he will become a carrier. These cats are typically well, but they will have recurrences of sneezing. Cats with the calicivirus will constantly shed the virus, while those with rhinotracheitis will only shed when stressed. It is important in both cases to support the immune system with a high-quality diet, regular check-ups, and a loving environment. If a can has not already been infected with a rhinotracheitis virus, the calicivirus, or chlamydia, vaccination is usually quite successful in preventing infection. For cats that are already carriers of these viruses or bacteria, it is still important to vaccinate. You see, if a carrier cat should reactivate the virus and begin shedding it, periodic vaccination provides the immune system with a "reminder." This allows the immune system to produce antibodies - the defense agents of the immune system - which can be readily available to begin fighting the infection. Thus, the cat may still develop a URI, but the consequences will be less severe, and the recovery faster. Even indoor cats should be vaccinated, since the viruses are airborne and can be brought into the house on your clothing or by other means. Also, indoor cats may already be carriers of the viruses and therefore need the periodic boost in immunity. Do you suspect your kitty has a URI?